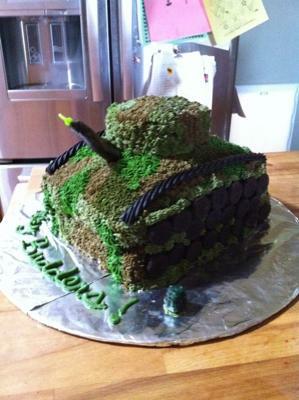 This tank cake was for my nurse's son for his 9th birthday, we work on an Army base so what better cake? I baked two 8x8 cakes and a one large cupcake, I trimmed and shaped the square cakes (one chocolate one vanilla) to more of a rectangular look and used applesauce for the chocolate cake (chocolate always seems to not carve well! ); then shaped the frozen large cupcake to look like a turret. In between the layers I made an apricot cream cheese "ganache" which was apricot jam melted and added to some buttercream and yes, canned cream cheese frosting to make the turret and two layers stick. I used a regular buttercream frosting recipe and grabbed five bowels with varying colors of green and brown to pipe using a star tip (the fast way for me to do it) and my 9 year old grabbed some small oreos for tank wheels and she placed them on. Also if you notice, there are grenades hand carved, this was dyed marzipan (my 9 year old again did this) and placed by the tank. The candle was the "gun" which was covered in marizpan to match the tank. Of course some black licorice for extra black "metal" around the tank for definition! Towards the end I had tried some already dyed green buttercream and dabbed gel coloring by Wilton in the bag for contrasting "streaks" to ensure there were not too many of the same colors everywhere. That's neat, I want to try doing one. Return to December 2011 Cake Decorating Contest Submission Form.